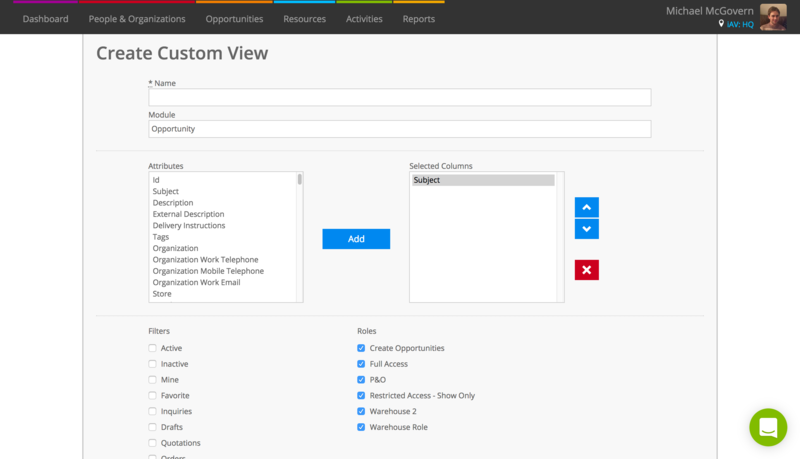 Custom views let you choose what information you see when you’re looking at your Resources, Opportunities, People & Organizations, and other screens throughout your Current RMS system. With custom views, you can choose exactly the information you’d like to see and how it is displayed. Where can you create custom views? 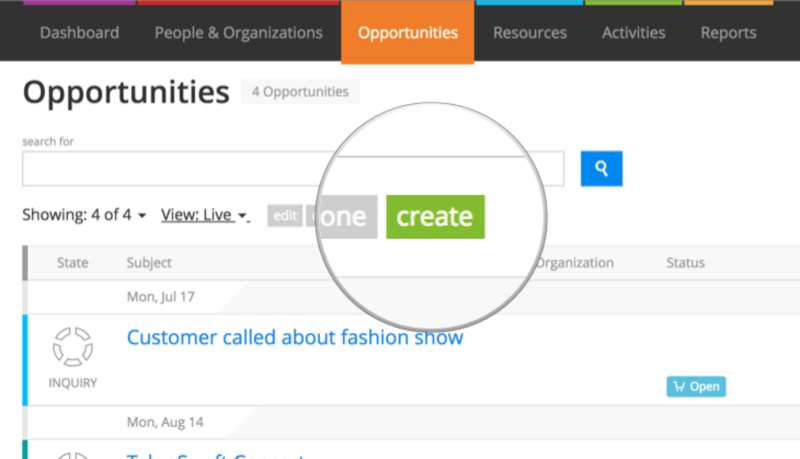 You can even create and use custom views on a list of activities, such as those linked to an opportunity, or a list of opportunities, like those linked to an organization. 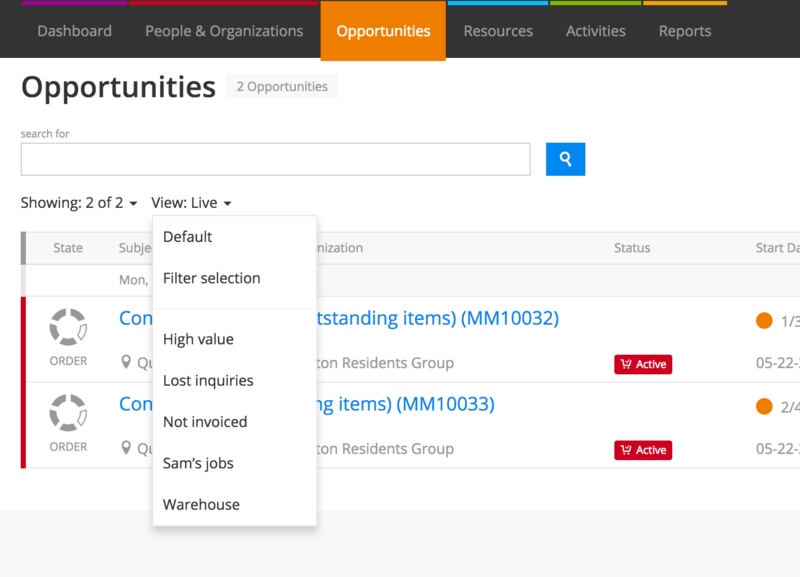 Simply click view all opportunities or view all activities and you’ll see the View: option. What kind of views can you create? Create a view with no filtering to create tabular view of your products rather than our catalog. See invoices where the due date has elapsed and the invoice hasn’t been marked as paid. Never forget to invoice a job – create a list of orders that haven’t been invoiced yet. Create a list of all pending activities with the type “call” that are yours. Create a view that shows your opportunities that have been marked as dead or cancelled. To create a custom view, click into the main page where you’d like to create your view and hover over View. You should see four buttons appear, click the green create button. You’ll see the “Create custom view” screen. Choose a name for your view. This appears in the list of views once created. Select the kind of data you want to appear in your view here. On some screens, you won’t be able to change this. Attributes are the column headings that you’ll see on your custom view. Choose an attribute that you’d like to have as a column in the list on the left and click the blue add button to move it to the list on the right. Re-order these columns by using the up & down buttons to the right; delete using the red cross. Select multiple attributes by holding down command ⌘ on Mac or control on Windows when clicking. Use filter to quickly filter the data that you’ll see in this view. Filters are optional, you don’t need to select any. If you tick “orders” and “active,” this will return all active orders. If you tick “orders,” “quotations” and “active,” this won’t return any data because an opportunity cannot be both an order and a quotation. If you’d like to use OR criteria, i.e. to show data that matches ANY filters, then you can use Criteria, described below. Choose to make this view available for particular roles by ticking these boxes. This is handy if you’d like to create views for each of your departments, e.g. warehouse views, accounts views, etc. Use Criteria to really drill down and filter the data you see in your view. You can add criteria as simple as Open ended rental + is true to make a view that will show you all open ended rentals, or create more complex views that combine multiple criteria using AND and OR operators. In opportunities, Rental charge total + is greater than + 2000 AND Start date + is this month will show you any opportunities where the rental goods are more than $2000 that start this month. In invoices, Status + is + issued AND status + isn’t + voided AND Due date + last 30 days will show you any invoices where the invoice is issued but not paid where the due date is in the last 30 days. Once you’re done, hit the blue Create custom view button to create. You’ll be taken straight to your view. Click on the View: menu to see all your views and switch to one. While you have a custom view active, hover over the View: menu and use the blue edit, delete, and clone buttons to edit, delete, or clone a view. If you want to get this data out of Current RMS, click the download icon at the top-right to export it as a CSV file. From here, you can open in your spreadsheet application in order to work with the data, or even use it to import to third-party services. You might like your custom view more than the default ones we provide. If this is the case, set your custom view as default so that it’s the view you see by default when you click into a module. To do this, switch to your custom view and then choose Set this view as my default from the View menu.